Inflammatory root resorption is a pathologic condition caused by several etiologic factors including traumatic dental injury. In this case report, we describe treatment of a maxillary lateral incisor affected by severe, perforating inflammatory root resorption. An 11-year-old patient presented with a previously traumatized, root-filled maxillary lateral incisor associated with pain, mobility and a sinus tract. Radiographic examination revealed a large periradicular lesion involving pathologic resorption of the apical region of the root. After removal of the root canal filling, the tooth was treated with intracanal calcium hydroxide for 2 weeks. The calcium hydroxide dressing was then removed and the entire root canal was filled with mineral trioxide aggregate. The endodontic access cavity was restored with composite resin. After 1 year, advanced osseous healing of the periradicular region had occurred and no clinical symptoms were apparent. In the following case report, we describe the clinical and radiographic condition of a previously traumatized, root-filled maxillary incisor, severely affected by perforating IRR and the results 12 months after treatment with MTA. A healthy, 11-year-old boy was referred to the clinic with the chief complaint of pain and swelling in the buccal gingival aspect of the maxillary right lateral incisor. Reportedly, the tooth had been traumatized during an accidental fall when the boy was 9.5 years old, and emergency treatment with splints and antibiotic coverage was provided by a local dentist. Two months later, the dentist initiated endodontic treatment of the incisor as the patient was experiencing persistent pain. A year after root canal obturation, when the patient returned with pain and swelling, the dentist recommended retreatment at a university clinic. Intraoral examination revealed a discoloured crown on the maxillary right lateral incisor, associated with a buccal sinus tract. The tooth was slightly mobile and tender to percussion. Radiographic examination of the lateral incisor showed extensive, uneven resorption of the apical region of the root, along with a large periradicular radiolucency (Fig. 1a). A very short root canal filling was observed, with its thin tip extending into the resorption cavity. When the lamina dura was traced from the mesial aspect of the root, a conical apical structure, highly suggestive of a root apex, could be identified. As radiographs acquired at the time of the diagnosis of apical periodontitis were not available, it was assumed that the local practitioner had preferred to obturate the root canal below the level of resorption or, in the possible case of a wide open apex, below the level of apical convergence. On the basis of these clinical and radiographic findings, an endodontic retreatment plan involving intracanal placement of MTA for the treatment of IRR was proposed to the parents and patient. On approval of the plan, treatment was initiated at the same appointment. Following anesthesia and placement of a rubber dam, gutta-percha and sealer were gently removed from the root canal with Hedströem files (Dentsply-Maillefer, Ballaigues, Switzerland) and it was irrigated copiously with 1.25% sodium hypochorite (NaOCl). During instrumentation, special care was taken not to enlarge the root canal. 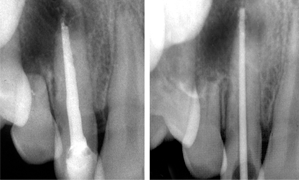 A confirmatory periapical radiograph revealed the extent of a large, semilunar-shaped perforating resorption defect affecting the apical third of the root (Fig. 1b). After removal of the root filling, final irrigation with 1.25% NaOCl and sterile saline was carried out and the root canal was dried with sterile paper points. Calcium hydroxide dressing was placed in the canal and a temporary coronal seal was established with Cavit (3M ESPE, Seefeld, Germany). Figure 1: (a) Radiographic view of the maxillary lateral incisor showing pathologic root resorption and a periradicular lesion. (b) View of the root following removal of the root canal filling. A gutta-percha cone shows the extent of perforating inflammatory root resorption. When the patient returned 2 weeks later, the sinus tract had disappeared and he was free of symptoms. The calcium hydroxide dressing was removed gently using ample amounts of 1.25% NaOCl and sterile saline, and the canal was dried with paper points. MTA (White Pro-Root MTA; Dentsply-Maillefer) was prepared according to the manufacturer's instructions, and a small portion of the material was deposited 1 mm below the coronal aspect of the resorption site using a ProRoot MTA delivery gun (Dentsply-Maillefer). MTA was then gently packed to the working length with an endodontic plugger. The procedure was repeated several times until the root canal was filled with MTA to about 1 mm apical to the gingival level (Fig. 2a). A wet cotton pellet was placed on the MTA and the cavity was sealed temporarily with glass ionomer cement. After an uneventful waiting period of 1 week, the access cavity was reopened and restored with hybrid resin composite (TPH Spectrum Dentsply/DeTrey Konstanz, Germany) and bonded with an etch-and-rinse adhesive (Prime & Bond NT, Dentsply/DeTrey). At 6 months follow-up, radiography showed initiation of osseous healing in the periradicular lesion and the absence of clinical symptoms and mobility (Fig. 2b). After 1 year, the lesion had healed almost completely, demonstrating advanced regeneration of the periradicular tissue and no increase in the size of the resorption site (Fig. 2c). Figure 2: (a) Periapical radiograph showing root canal filled with mineral trioxide aggregate. (b) Radiographic view of the tooth at 6 months and (c) 1 year. Note the extent of periradicular healing and the stability of the resorption site. Because of the asymptomatic nature of IRR and its diverse morphological manifestations, precise diagnosis of most IRR defects cannot be made from 2-dimensional radiographs.3,23 As in the case described here, an existing root canal filling, which may be superimposed on the resorption lesion, may further complicate diagnosis from a radiographic image. Although cone-beam computed tomography (CBCT) has been shown to be significantly better in facilitating IRR diagnosis compared with periapical radiography,23 such technology was not available at our centre when the patient was admitted. In addition to many laboratory studies, biocompatibility and the hard tissue inductive effect of MTA have been confirmed in humans, especially when MTA is used as a root-end barrier in teeth with immature apices15,16 and in root perforations.18 In the case described here, 6- and 12-month radiographic findings revealed that healing of the resorption site was not affected by the slight extrusion of the MTA beyond the root canal. This corroborates the findings of previous animal32 and human16 studies, demonstrating that contact between extruded MTA and periapical tissues does not elicit a host response and, thus, is not an obstacle to healing. Although re-establishment of the entire periodontal space did not occur, treatment in the present case was considered successful both clinically and radiographically. There was complete healing of the radiolucency in the alveolar bone and continued regeneration of osseous tissue, while the resorption site remained stable throughout the 12-month follow-up period. Overall, both the patient and parents were satisfied with the treatment outcome as the permanent tooth remained functional. Dr. Guzeler is a research assistant in the department of pediatric dentistry, faculty of dentistry, Hacettepe University, Ankara, Turkey. Dr. Uysal is an assistant professor in the department of oral diagnosis and radiology, faculty of dentistry, Hacettepe University, Ankara, Turkey. Andreasen JO, Andreasen FM. Essentials of traumatic injuries to the teeth. 2nd ed. Copenhagen: Munksgaard; 2001. p. 188. Trope M, Chivian N, Sigurdsson A, Vann WF. Traumatic injuries. In: Cohen S, Burns RC. Pathways of the pulp. 8th ed. St Louis: Mosby; 2002. p. 603-49. Nair PN. Apical periodontitis: a dynamic encounter between root canal infection and host response. Periodontology 2000. 1997;13(1):121-48. Andreasen JO, Andreasen FM, Bakland LK, Flores MT. Traumatic dental injuries — a manual. 1st ed. Copenhagen: Munksgaard; 2000. p. 10. Laux M, Abbott PV, Pajarola G, Nair PN. Apical inflammatory root resorption: a correlative radiographic and histological assessment. Int Endod J. 2000;33(6):483-93. Andreasen JO, Bakland LK, Matras RC, Andreasen FM. Traumatic intrusion of permanent teeth. Part 1. An epidemiological study of 216 intruded permanent teeth. Dent Traumatol. 2006;22(2):83-9. Weltman B, Vig KW, Fields HW, Shanker S, Kaizar EE. Root resorption associated with orthodontic tooth movement: a systematic review. Am J Orthod Dentofacial Orthop. 2010;137(4):462-76. Gunraj MN. Dental root resorption. Oral Surg Oral Med Oral Pathol Oral Radiol Endod. 1999;88(6):647-53. Altundasar E, Demir B. Management of a perforating internal resorptive defect with mineral trioxide aggregate: a case report. J Endod. 2009;35(10):1441-4. Heithersay GS. Clinical endodontic and surgical management of tooth and associated bone resorption. Int Endod J. 1985;18(2):72-92. Al-Kahtani A, Shostad S, Schifferle R, Bhambhani S. In-vitro evaluation of microleakage of an orthograde apical plug of mineral trioxide aggregate in permanent teeth with simulated immature apices. J Endod. 2005;31(2):117-9. Mente J, Hage N, Pfefferle T, Koch MJ, Dreyhaupt J, Staehle HJ, et al. Mineral trioxide aggregate apical plugs in teeth with open apical foramina: a retrospective analysis of treatment outcome. J Endod. 2009;35(10):1354-8. Zhang H, Pappen FG, Haapasalo M. Dentin enhances the antibacterial effect of mineral trioxide aggregate and bioaggregate. J Endod. 2009;35(2):221-4. Epub 2008 Dec 12. Torabinejad M, Parirokh M. Mineral trioxide aggregate: a comprehensive literature review--part II: leakage and biocompatibility investigations. J Endod. 2010;36(2):190-202. Vanderweele RA, Schwartz SA, Beeson TJ. Effect of blood contamination on retention characteristics of MTA when mixed with different liquids. J Endod. 2006;32(5):421-4. Holland R, Filho JA, de Souza V, Nery MJ, Bernabé PF, Junior ED. Mineral trioxide aggregate repair of lateral root perforations. J Endod. 2001;27(4):281-4. Estrela C, Bueno MR, De Alencar AH, Mattar R, Valladares Neto J, Azevedo BC, et al. Method to evaluate inflammatory root resorption by using cone beam computed tomography. J Endod. 2009;35(11):1491-7. Byström A, Happonen RP, Sjögren U, Sundqvist G. Healing of periapical lesions of pulpless teeth after endodontic treatment with controlled asepsis. Endod Dent Traumatol. 1987;3(2):58-63. Sjögren U, Figdor D, Persson S, Sundqvist G. Influence of infection at the time of root filling on the outcome of endodontic treatment of teeth with apical periodontitis. Int Endod J. 1997;30(5):297-306. Hülsmann M, Hahn W. Complications during root canal irrigation--literature review and case reports. Int Endod J. 2000;33(3):186-93. Sjögren U, Figdor D, Spångberg L, Sundqvist G. The antimicrobial effect of calcium hydroxide as a short-term intracanal dressing. Int Endod J. 1991;24(3):119-25. Hammarstrom L, Lindskog S. General morphological aspects of resorption of teeth and alveolar bone. Int Endod J. 1985;18(2):93-108. Valois CR, Costa ED Jr. Influence of the thickness of mineral trioxide aggregate on sealing ability of root-end fillings in vitro. Oral Surg Oral Med Oral Pathol Oral Radiol Endod. 2004;97(1):108-11. Barrieshi-Nusair KM, Hammad HM. Intracoronal sealing comparison of mineral trioxide aggregate and glass ionomer. Quintessence Int. 2005;36(7-8):539-45. Ozdemir HO, Ozçelik B, Karabucak B, Cehreli ZC. Calcium ion diffusion from mineral trioxide aggregate through simulated root resorption defects. Dent Traumatol. 2008;24(1):70-3. Shabahang S, Torabinejad M, Boyne PP, Abedi H, McMillan P. A comparative study of root-end induction using osteogenic protein-1, calcium hydroxide, and mineral trioxide aggregate in dogs. J Endod. 1999;25(1):1-5.